Newmed is an internationally trusted manufacturer of high quality medical sterilizers. Featuring a stylish, Italian design and curved edges for easy cleaning, Newmed sterilizers utilise leading technology at affordable prices. 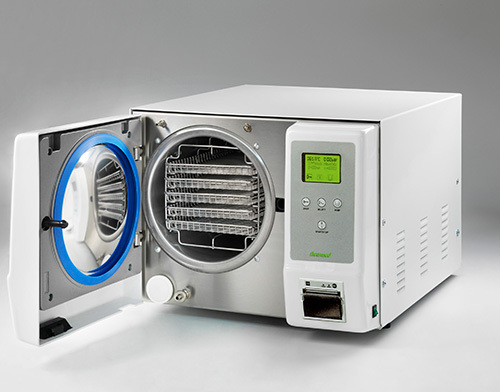 Newmed sterilizers are suitable for solid, hollow or wrapped instruments and porous loads. With fast, pre-programmed cycles and an automatic door closure mechanism, you and your staff can be sure of the utmost safety when you are using a Newmed sterilizer. 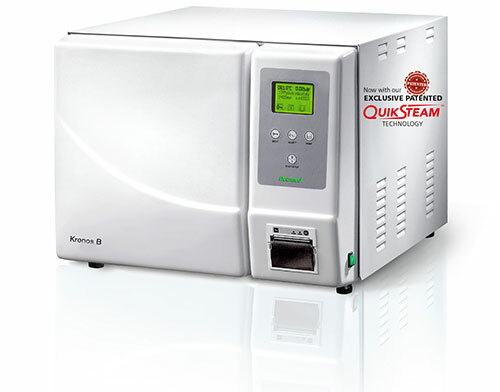 Thanks to the cutting edge research and development of our talented and experienced R&D engineers, all Newmed Kronos Class B sterilizers are now able to achieve even more rapid Class B cycle times of up to 20% faster with our exclusive, QuikSteam™ technology. With leading technology and designed for high performance, the Kronos sterilizer range also features simplistic navigational system and an easy-to-use interface. Available in B, S or N class and in sizes ranging from 6 to 23 litres, the Kronos is the perfect solution for busy practices requiring a high throughput. If you have your own treated water supply, you have the option to permanently plumb the unit in and connect to your own drainage system. Including a printer as standard on all models and an optional USB port for effortless data capture, the Kronos range offers full record keeping capabilities Enabling you to comply with your local regulations and best practices. All our Newmed sterilizers include simple and cost-effective service protocols to ensure a minimal cost of ownership and the shortest interruption in operation for service throughout the lifetime of your sterilizer. Call us, email us or stop by the office. We're always here for you.